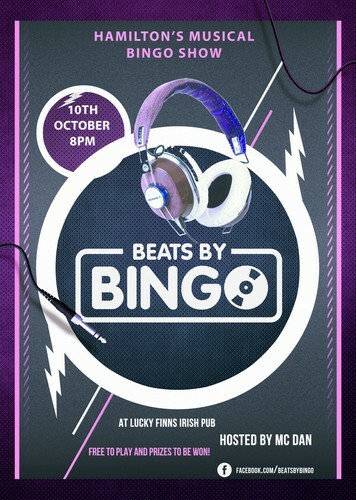 Beats By Bingo may be the upcoming event you’re looking for. Lucky Finns hosts the best musical bingo show around! instead of numbers on your bingo card, its song titles! With different genres like Rock, Kiwi, 80s, Guilty Pleasures and more theres always something for everyone. This bingo show will have you dancing in your seat and hoping to shout out bingo! Fab prizes up for grabs thanks to Lucky Finns, don't be late as MC Dan spins the tunes at 8pm sharp! Free to play!